The Food & Art event will give guests the chance to sample some exclusive wines and foods imported from Greece and France, served on the opening night. 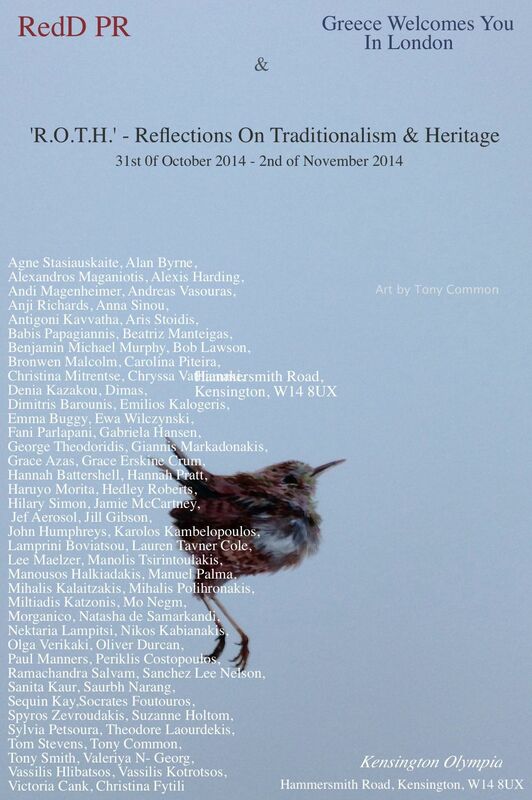 Private view for R.O.T.H. will be held on the 31st of October 2014 18:00pm – 22:00pm. Tickets to the event start at £4 and can be purchased at the door on the night or through the Greece Welcomes You In London website, which will also provide tickets to the trade show happening on the floor organised by GREEK AGORA EXPO. All tickets purchased will be put in an automatic lottery for various gifts from our sponsors including a flight for 2 couples to Crete Greece with stay at a 5 star hotel. Press/Collectors will be able to visit both spaces free of charge with tickets provided to them via administration.